Come join the specially designed local building tours to understand how signature building projects could integrate and perform well in the unique high-rise high-density built environment of Hong Kong. Pick one of the routes (Hong Kong Island / Kowloon / New Territories) for your exploration on 13 and/or 14 Dec 2018 to experience and discover history present and future of the cities. Registration: Please make the booking and pay via ConfTool online registration system while you are making a registration to the Conference. 1. The organiser reserves the right to cancel or modify the itinerary if minimum participation is not attained or due to factors beyond its control. Registered partcipants will receive a 100% refund. 2. Tour fee will be refunded in Hong Kong Dollars. Bank charges to be borne by the participants. 3. In case of black rainstorm signal or typhoon signal no. 8 or above is hoised or issued 2 hours before the commencement of the trip, the tour will be cancelled. 4. Late arrivals and no shows are non-refundable. This is applicable to any tour participant that fails to arrive, or arrives after tour departure. After the Convention between Great Britain and China Respecting an Extension of Hong Kong Territory, the British government chose Tai Po as their administrative centre in the New Territories. This guided tour aims to introduce important government buildings in Tai Po, and how each of them play their role since the colonial period. Since the beginning of the colonial period, the Europeans settled mainly on the Peak (the Hill District) and upper part of the mid-levels (the European District). The Chinese mainly moved to the lower mid-levels and down hill in crowded, unsanitary living conditions. This guided tour will reveal different living situations in the old days, ranging from wealthy residence to government quarters and grass-root tenement houses in the mid-levels area. The Zero Carbon Building is a green building that showcases the state‐of‐the‐art eco‐building design and technologies to both the local and the international construction industry. 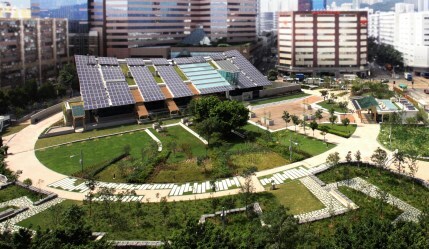 The Energizing Kowloon East Office (EKEO) Building is a champion of sustainability by using a raft of integrated green building technologies and lean construction methods and low embodied energy materials to become Hong Kong's first low carbon temporary office. 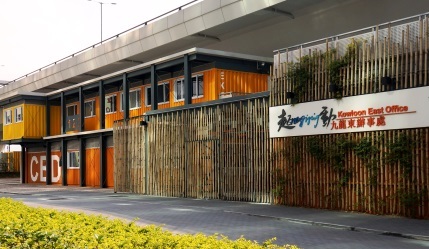 The innovative and green EKEO building is also the first temporary office building provisionally given the Building Environmental Assessment Method (BEAM) Plus Platinum rating certified by the Hong Kong Green Building Council, demonstrating various environmental benefits. The Hong Kong Housing Authority Exhibition Centre is a showcase of public housing development in Hong Kong. There are informative display panels, interesting building models, nostalgic mock-up flats and myriad collections of photos and videos to tell you the story of Hong Kong's public housing.